It's not often you find a chef who has over 30 Years I.T. Experience! The developer of this software trained as a chef in Spain in the early 80's then went on to work in IT for 30 years. 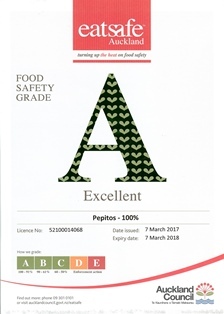 With a wife in the restaurant trade at Pepitos® restaurant in Auckland and also her Paella Catering Company "Cook at Home Paella"
With the changes that MPI introduced in March 2016 it was obvious the proliferation of paperwork is too hard to adhere to in a working kitchen environment. So the team at Four Acres Ltd developed a cloud based computer system to simplify the task for chefs and management. Four Acres Ltd, has developed a role based, multi-language, cloud based Food Control Plan system, that allows you to create your custom food control plan and provides you with simple, easy to follow prompts to ensure that it's adhered to at all times. Food Safety Records, need to be maintained for 4 years, so why keep paper records when you can use a paperless cloud based solution. Use this system to build your Food Control Plan for you by simple step by step instructions, your Food Control Plan can be prepared in just a few hours. As well as satisfying all the requirements of the Food Control Plan, it also satisfies all elements of your Liquor License, recording Duty Managers on duty and incident reporting. Using a computerised system, efficiencies within your business will improve as staff are prompted on a daily basis what they need to do to conform to the food control plan. Staff are reminded what tasks need to be addressed and then make note of what they did during the shift and key in the information when the sign off at the end of the shift.